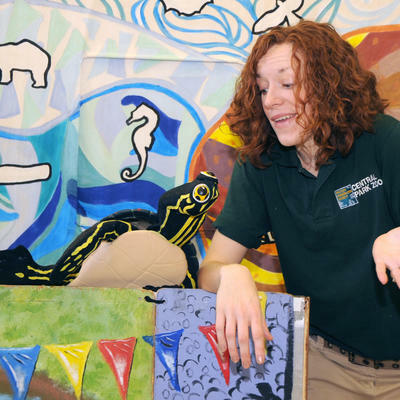 Wildlife Theater is the WCS's educational outreach program that brings the Zoo to You. This program uses theater to teach young people about wild things and wild places, helping to build the next generation of conservationists. Performances are self-contained, interactive, fun and include songs, stories, games and puppets. Programs are aligned with state standards. A Wildlife Theater visit to your facility will bring natural science to life for your young learners in a very memorable way. 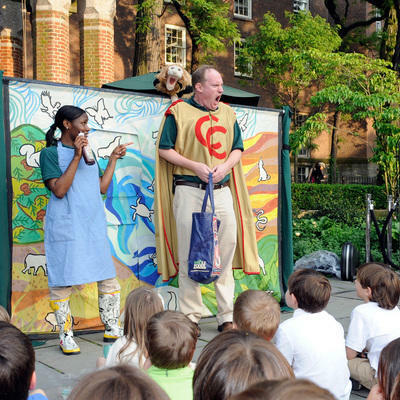 We take the audience on an adventure with our superhero, Captain Cocoa, who is convinced he can save the rainforest. In fact, he learns, it might be the average person who can save the day. Students learn about the rainforest habitat and simple conservation actions. Antarctica and the Arctic Circle are the two ends of the world. They look and feel the same, but very different types of animals call these icy lands home. Students explore the similarities and differences through two shows, "Polar Bear and the Beat" and "A Penguin State of Mind." Join Cope and Marsh as they go on an adventure back in time. 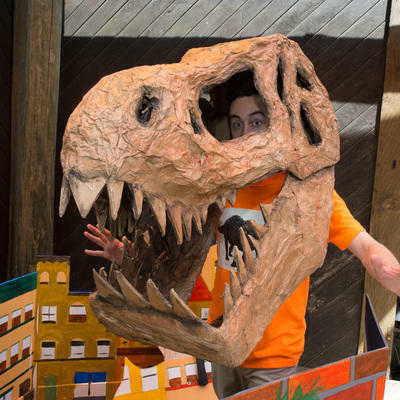 Through puppets and song, students; learn about how dinosaurs adapted to the world. HINT: They were actually a lot like adaptations today. Think bugs are gross? Think again! We'll take you and your students on a 3,000-mile adventure and show you why they're actually the coolest creatures around. 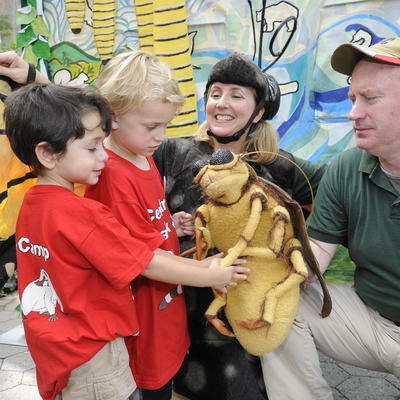 The musical, interactive performance introduces students to metamorphosis and the interdependence of plants and animals. Learn about the layers of the rainforest and animals that reside in each one, as well as habitat geography . Plus travel along with our superhero in, "The Adventures of Captain Cocoa." Why would a wild polar bear never eat a penguin? Find out and learn many other facts about penguins and their amazing adaptations in our interactive show, "A Penguin State of Mind." You'll also learn about the importance of conservation as it relates to a polar habitat thousands of miles away. 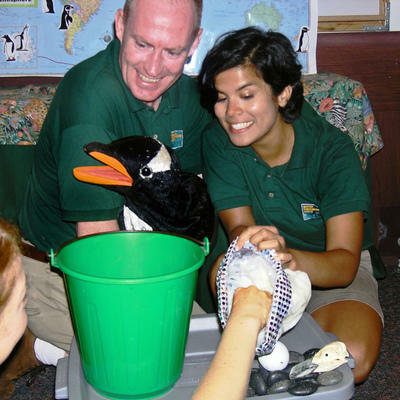 Bring Wildlife Theater right into your classroom with our WILD (Wildlife Integrated into Language Development) Achievements Program. The WILD Program provides an unforgettable classroom experience for 36 or fewer students. Shows feature language development, science, and theater, and offer one-on-one, hands-on learning opportunities with our instructor-performer team. 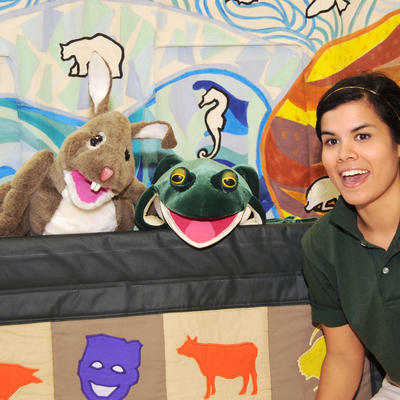 Our puppet troupe featuring Rhonda the Rabbit comes to your class. We'll perform some short, interactive shows feature singing, guessing games, and storytelling about the animals you might find in a pond or barnyard. Students learn basic animal concepts such as shapes, sounds, locomo­tion, and metamorphosis. Our costumed character, Petunia Penguin, and polar explorer Admiral Bird transform your students into a team of Antarctic scientists. Through drama, games, and songs, we lead you on a chilly exploration. Using literacy development skills, students discover the adaptations penguins need to survive the harsh polar habitat. Bring the tropics to your classroom with a visit from our Youcan the Toucan puppet and explorer Jungle Jane. Together, they embark on an adventure that will transform your students into a jungle exploration team. 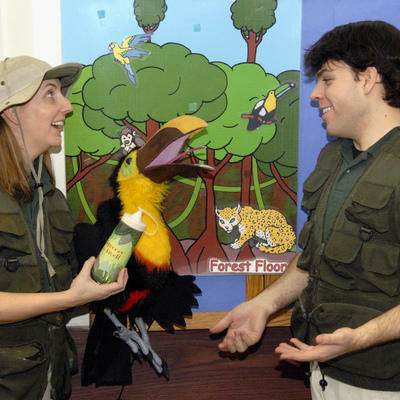 Using their five senses, students experience a unique introduction to the rainforest that features creative drama, storytelling, and puppets. Frankie the Frog and friends show the students what life in a pond is really like for a frog. Students have a blast during this interactive program featuring magic, songs, puppet shows and games about pond and animal life. Students learn about polar life and the special adaptations penguins need to survive there. Our actor-instructor team leads the group in hands-on learning and deductive reasoning featuring biofacts, games, drama, and puppetry. The students also learn about the challenges facing the polar regions and what they can do to make a difference. 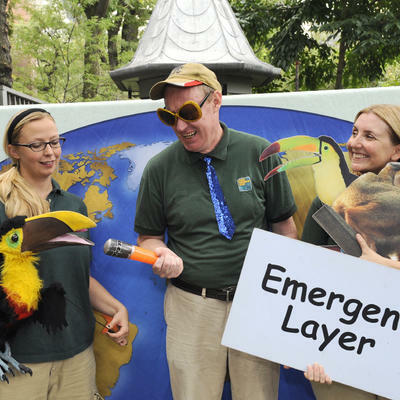 Come see us at the Central Park Zoo. 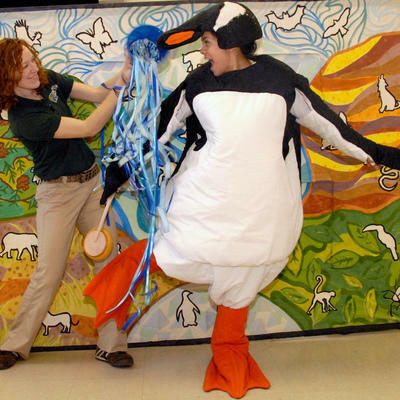 Wildlife Theater is offering private, one-hour programs that include a Wildlife Theater performance, an animal encounter, and a visit to an exhibit. Choose from rainforests to rivers and from bears to butterflies. Children will have the unique opportunity to touch a live animal related to your selected topic. Advanced booking required. Call 1-800-433-4149, email wildlifetheater@wcs.org, or fill out a booking request. Download a printer friendly version of our Wildlife Theater brochure. 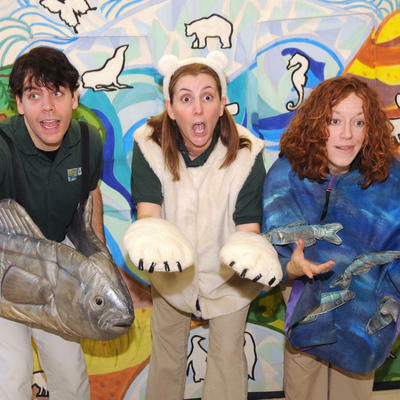 All bookings for Wildlife Theater include Pre and Post Teachers Guides that connect to the themes covered in the performances.